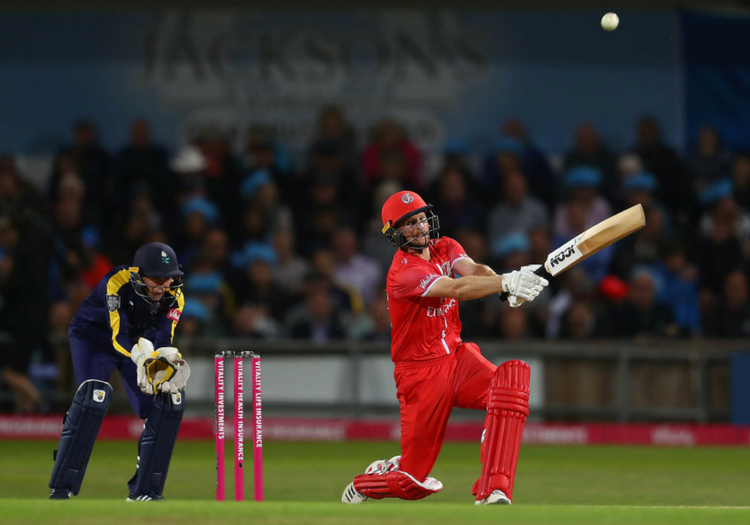 Lancashire secured a crucial come-from-behind Roses win over Yorkshire at Emerald Headingley to revive their Vitality Blast quarter-final hopes. The Lightning comfortably chased down 182 to win for the first time in five North Group games since claiming the first clash between the two at Emirates Old Trafford last month. A strong top-order performance highlighted by Arron Lilley’s blistering career-best 47 off 20 balls was enough to secure a six-wicket triumph with 14 balls remaining. Opener Karl Brown top-scored with 51 off 34 balls, but they owed a huge debt of gratitude to their bowlers, who claimed eight wickets for 51 in the last 8.1 overs of the Vikings innings. Yorkshire finished on 181 for nine having been 102 for one at halfway and 130 for one in the 12th, with David Willey smashing 80 off 43 balls. Australian overseas allrounder James Faulkner struck three times in a superb last over, while wrist spinners Matthew Parkinson and Zahir Khan struck twice apiece. Parkinson (2-31) was particularly impressive. Alex Davies then got the Lightning’s chase off to a flyer with a quickfire 34 as the visitors moved above the Vikings into third place with 13 points to 12 after eleven games. After Steven Croft and Faulkner conceded six from the first two overs, Yorkshire really got going through Willey, who was ably supported by Tom Kohler-Cadmore. Kohler-Cadmore, who hit 46 off 33 balls, was dropped twice in the deep but was happy to give Willey the strike as the Vikings reached halfway at 102 for one. After Kohler-Cadmore was dropped for the first time on nine off Faulkner in the fourth over, Willey hit two of three fours in the over and later reached 50 off 31 balls with his fourth leg-side six. Willey and Kohler-Cadmore shared 129 in 11.4 overs for the second wicket to recover from one for one in the first over. Lancashire’s fielding was sloppy, but they hit back well and took those eight wickets in the last 8.1 overs of the innings, including Faulkner’s treble in the last over and two apiece for Zahir Khan and the impressive Parkinson. If anything, after their excellent start, Yorkshire perhaps went a bit too hard, with a series of miscues resulting in catches. Lancashire then started their chase superbly through Davies and Brown, with the former uppercutting Jack Brooks for six over cover having offered a tough catch to Steve Patterson at five at mid-on earlier in the fourth over as the score reached 40 without loss. Patterson gained revenge and bowled Davies, trying to reverse scoop, as the score fell to 57 for one in the sixth. But pinchhitter Lilley was equally destructive. He smashed two sixes off Azeem Rafiq’s off-spin and hit four in all as he bettered a previous best of 42 not out in last month’s home clash. He fell to Jordan Thompson as Willey took a superb diving catch at deep midwicket (114 for two in the 11th), though Lancashire never looked like letting this one slip. Brown reached 50 off 33 balls before being run out in the 15th over, in which Patterson also struck to leave the score at 162 for four. However, it was too little, too late for Yorkshire.